The southern half of the North Central State Trail extends 28.1 miles from Gaylord to Indian River with almost half of it along the Sturgeon River. Gaylord is the southern terminus and also the highest point of the trail at more than 1,370 feet. Those without the ability to spot a car often begin in Gaylord and ride to Vanderbilt and back for a 15.2-mile outing. The 10.9-mile section between Vanderbilt and Wolverine is perhaps the most interesting portion in the southern half, a wilderness-like setting where only a few roads are crossed. 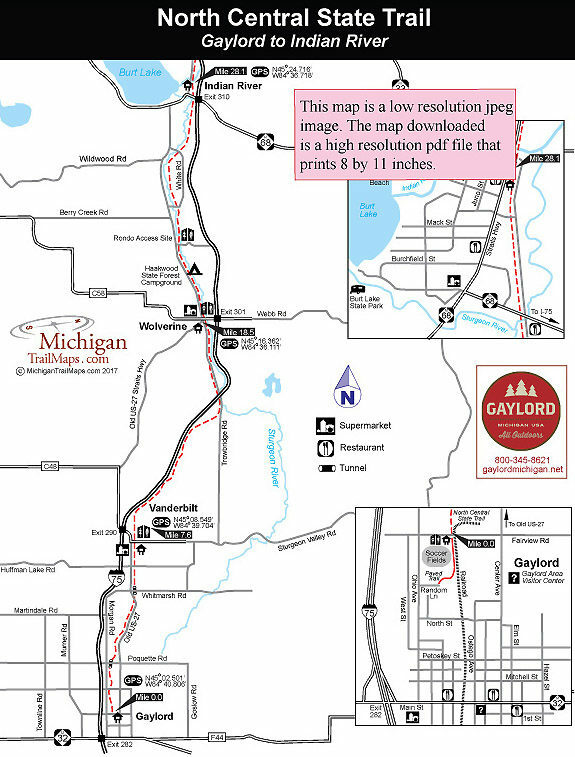 The Gaylord trailhead is a mile north of M-32 downtown on Fairview Road at the Alpine Soccer Complex. Head north from M-32 on Old US-27 and turn west (left) on Fairview Road to quickly reach the trailhead. On the south side of Fairview there is parking and vault toilets, on the north side the North Central begins as a paved path but within a 100 yards becomes a crushed limestone rail-trail. From Gaylord the trail begins its gradual descent to Vanderbilt, dropping nearly 300 feet in 7 miles. 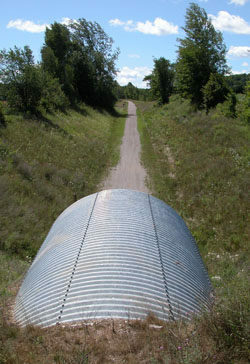 The scenery begins as rolling farm country and includes a metal culvert tunnel under Poquette Road and another under Whitemarsh Road. Here the North Central moves into a more wooded setting before breaking out at the town of Vanderbilt, crossing Main Street (Sturgeon Valley Road) at Mile 7.6. On the north side of Main Street is a small park with a vault toilet and a drinking water. A block west of Main St is Mill Street (also called Old US-27) where you’ll find restaurants and a small market. Even though most of the time I-75 is less than a quarter mile away from the trail, the stretch to Wolverine is the most remote section of the North Central. After leaving Vanderbilt it, crosses only one road in the first 8 miles, winding through forest and skirting scenic wetlands, creeks and, halfway to Wolverine, a large beaver dam and pond. that open up to wetlands, creeks and, halfway to Wolverine, a large beaver dam and pond. At Mile 12.5 the North Central begins skirting Stewart Creek and then crosses it on a former railroad trestle. Within 0.7 miles it uses another railroad bridge to cross the Sturgeon River at a corner known as Trowbridge, passes underneath I-75, and on the other side uses a third trestle to cross the Sturgeon again. Anywhere along this stretch it’s often possible at times to see anglers fishing for trout. Wolverine is reached at Mile 18.5. The trail passes the town’s classic Michigan Central Depot that opened in 1906, when six passenger trains were stopping daily. Across from the depot is Wolverine Village Park on the banks of the Sturgeon with vault toilets and drinking water. The town’s business district is up the hill to the west along South Straits Highway. North of Wolverine the North Central closely skirts the Sturgeon, now a river with good size and volume. You can view the river often or stop at Haackwood State Forest Campground at Mile 20.6 for an extended break along it Within the campground are toilets and drinking water. Just to the north of the campground the trail crosses to the Sturgeon’s east bank at Rondo Public Access where there are toilets, parking and a bench down by the river that makes for a scenic spot for a break. At Mile 28.1, the North Central arrives at the town of Indian River. Just before crossing Indian River, the North Central passes the town’s original depot and arrives at a major trailhead at the Indian River Chamber of Commerce Visitor Center where there is parking, bathrooms and picnic tables. Ideally located just across the street is an ice cream shop.